Dragged on a family trip to Europe’s ancient cities, Becca wants nothing more than to go home. Trapped with her emotionally distant father, over-eager stepmother, and a brother who only wants to hook up with European hotties, Becca is miserable. That is until she meets Nikolai, a guy as mysterious as he is handsome. And she unknowingly finds herself with a runaway prince. Nikolai has everything a guy could ask for-he's crown prince, heir to the throne, and girls adore him. But the one thing he doesn't have...is freedom. Staging a coup, he flees his kingdom and goes undercover on his own European tour. 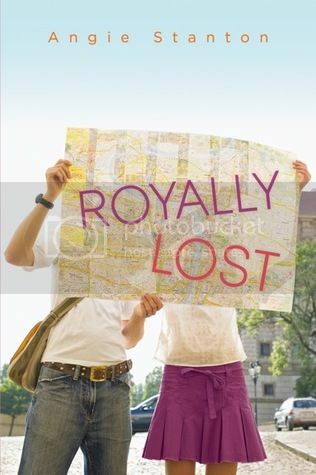 Royally Lost is one of those fairytale stories that you always see in the movies, where the average girl and the handsome prince meet in an unexpected way and fall madly in love. Yes, you’ve seen this storyline a hundred times, but somehow this book still manages to make the story fresh and appealing. I enjoyed following Becca and Nikolai on their European adventure. I liked that fate kept throwing them together at every available opportunity. They are two completely different people with completely different problems; but yet their problems are still really similar. And because of this they were able to form a bond that was stronger than just two people liking each other. As a parent, I didn’t always agree with the choices that they made, but I can see how the spontaneity would be tempting to a young adult. The story was told in the third person narrative, which I sometimes find really awkward to read. However, I didn’t really have much of a problem with it in this book. The storyline for the book was really cute, and is one that will make the girls swoon. One thing that I really, really enjoyed about the story was the setting. The descriptions of the places they visited where very well described, and made me long to visit Europe even more than I already wanted to before. Overall; there were a couple of things in the book that had me rolling my eyes because they were just super sweet, but I still thought it was a cute read. Fangirls are definitely going to love this book, and it definitely will make for a great summer read! I had dismissed this book because it just sounded and looked too cheesy, but from the sounds of things, it sounds lovely! I'll definitely have to keep an eye out for more reviews and see how I feel because this might be a maybe.. great review! This does sound like a nice sweet contemporary. I will have to order a copy for my library's teen collection. I may have to read it too as I like books about traveling in Europe. Thanks for the review!